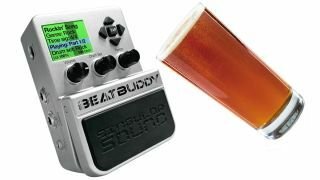 If there's one problem with drum machines, it's that they're too damn precise; there's just no danger of going off-piste like you would with a real drummer… until now, as BeatBuddy announces its new Sobriety Function. Adjusting the pedal's Sobriety setting takes the BeatBuddy from sober (playing normally) to tipsy (drifting on the tempo), drunk (prone to losing the 'one') and wasted (drum solo) - the saving grace is that a swift turn of the dial sobers BB right up again. The Sobriety Function is part of a firmware update that also bolsters the BeatBuddy with a sleep mode, visual metronome while drums are stopped and complete MIDI control.